If you have green splotches on the sides of your fish tank, then you may think you have a mold problem. While this is possible, it is highly unlikely since mold likes damp places but not necessarily saturated ones. In all likelihood, you have an algae issue. In most cases mold and algae on the sides of a fish tank can be resolved with a good cleaning. In some rare instances, you may have to replace the water in the tank or treat it to discourage recurring mold, but generally just keeping the sides of the tank clean will resolve the problem. However, if the problem has taken over the entire fish tank, you may have a larger problem on your hands and need to clean the gravel and plants as well in order to resolve it. If the water in the tank itself is growing globs of mold, then you will need to change the water in the tank. At this point, it is no longer a cleaning issue but rather a complicated process of changing your fish's water without killing them. You should work with an aquarium professional at that point. Wash your hands very thoroughly. You need to get everything off of them so that you do not accidentally rinse any contaminants into the fish tank that could hurt or kill your fish. Remove the gravel and plants. If you are trying to avoid actually changing the water, which can dramatically disrupt your fish's living environment and make them sick or kill them, then you will need to remove the gravel to clean it. You can simply scoop it out with your hands and place it in the colander in the sink. At this time, you can also remove any plants or aquarium decorations. Soak the gravel in a bleach and water solution. Generally, the best way to do this is to leave the gravel in the sink, plug the drain and fill the sink with water. Then add 1/4 cup of bleach. This will kill and remove the mold from the gravel. You can leave the gravel to soak for about 15 minutes while you wipe down the plants. Wipe down the plants and decorations with a paper towel. The mold should slide off the plastic and onto the paper towel. As soon as the paper towel is full of grime, move on to a new one so that you do not just smear the mold around. Use your fingers to push the paper towel into every nook and cranny of the decorations to make sure that there is no mold left. Rinse the plants thoroughly with clean water. You may want to wipe them down again with a clean paper towel while holding them under running water. Do not use any soap or cleanser, but just water and pressure from the paper towels. Now your plants are ready to be replaced in the aquarium once you have finished with the other aspects of the aquarium cleaning. Rinse the gravel. You need to drain the sink and rinse the gravel for at least ten minutes under hot running water. If there are any remnants of bleach on the gravel, it will kill your fish. Shake and stir the gravel in the colander to make sure that all of the bleach is gone. 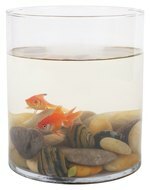 Many fish owners prefer to simply replace the gravel if it becomes moldy rather than risk exposing their fish to bleach. However, if you rinse the gravel sufficiently, then you can get all the bleach off. Use the paper towels to wipe down the sides and bottom of the tank. The mold and/or algae will come off on the paper towels. As soon as you have completely covered a paper towel with mold and other aquarium "gunk," move onto a new one. Otherwise, you run the risk of just scraping the mold off the sides and letting it loose in the water instead of keeping it stuck to the paper towel. Use your fingers to push the paper towels into the corners of the aquarium. Go over the sides of the aquarium twice once they appear to be clean. This will remove any remnants of your aquarium mold and also eliminate any smearing that remains. Try not to slosh the water around. Replace the plants and gravel. Do this gently, while trying not to disrupt the aquarium more than you already have. Replace the gravel in handfuls near the bottom rather than just dumping it in, and position the plants so that the gravel holds them in place. Add a suckerfish or snails to your aquarium. They will keep the mold and algae under control. Suckerfish like tropical aquariums and snails like freshwater aquariums.